My spawning tanks have a size of 40x25x25 cm (lxbxh) and are bare-bottomed. The latter makes it more easy to keep them clean. The water level is set around 10-15 cm and a temperature of 27-30 degrees Celsius is maintained using a 25 Watt heater. The tank is filled with floating plants. I personally prefer to use hornwort (Ceratophyllum demersum). Live plants in the spawning tank can function as support for the bubble nest, hide-out for the female during the spawning process and the will promote the growth of infusoria growth (microscopic organisms which are eaten by the fry the first days). 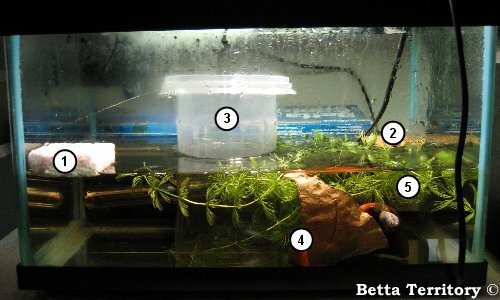 Further, the plants will also be used as hide-out for the fry after they have entered the free-swimming stage. I also use half a ceramic pot to provide some extra cover for the female during the spawning process. To promote a solid bubblenest different supports can be used, for example: a small piece of styrofoam, half a plastic cup, Indian Almond/Ketapang leaves, plants, etc. I personally always provide the male several options by giving him a piece of styrofoam in one corner and a piece of ketapang leave in the opposite corner.